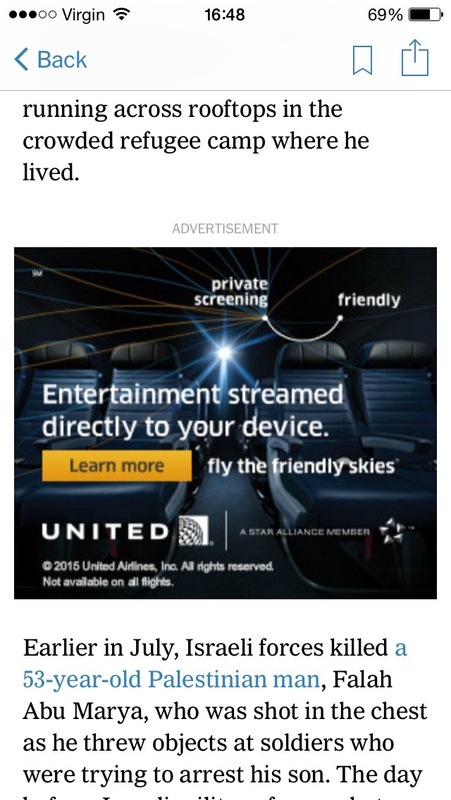 And discovered the story had disappeared. 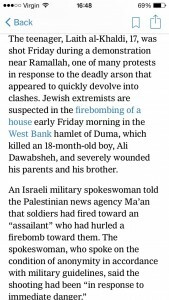 What appears in its place is more or less an entirely different article, sans those links: “Censure and Clashes After West Bank Attack“. 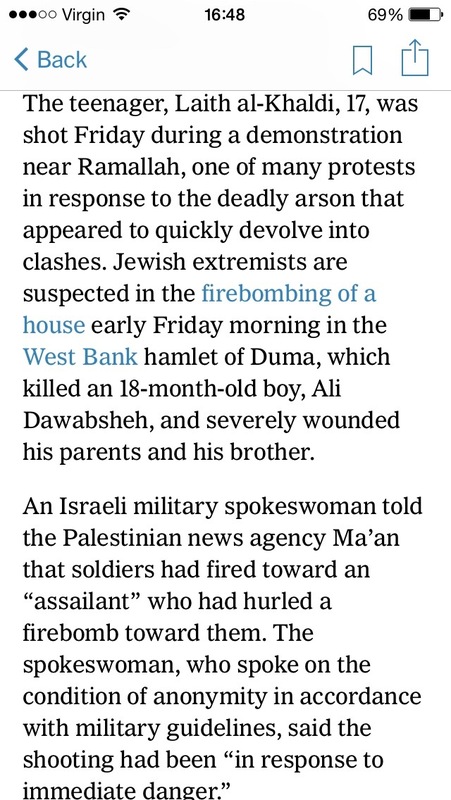 This takes a wider look at the protests that followed the arson; the account of Laith al-Khaldi’s death has been reduced to a few sentences toward the end. Even when I email the earlier version to myself from the app, or tinker with search terms, all roads seem to lead there. 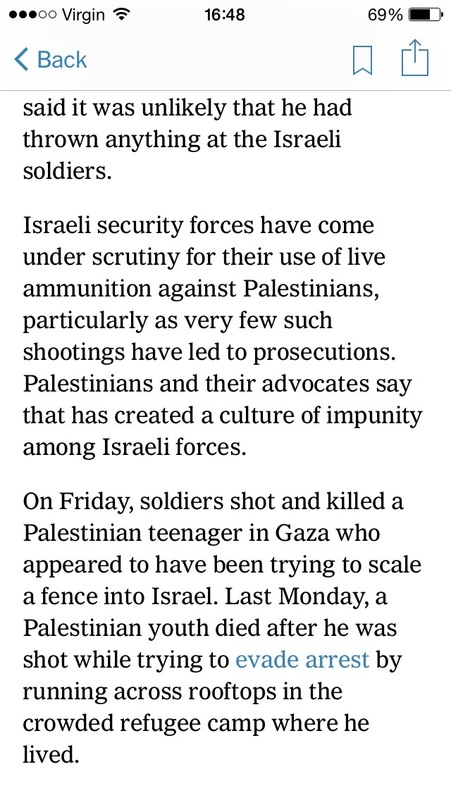 On Friday, soldiers shot and killed a Palestinian teenager in Gaza who appeared to have been trying to scale a fence into Israel. 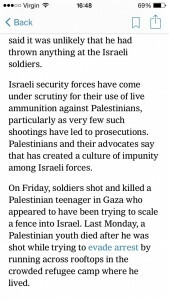 Last Monday, a Palestinian youth died after he was shot while trying to evade arrest by running across rooftops in the crowded refugee camp where he lived. 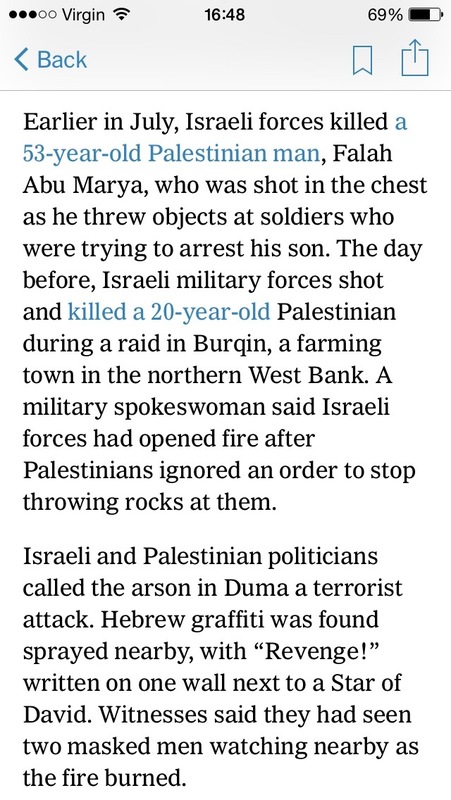 Earlier in July, Israeli forces killed a 53-year-old Palestinian man, Falah Abu Marya, who was shot in the chest as he threw objects at soldiers who were trying to arrest his son. 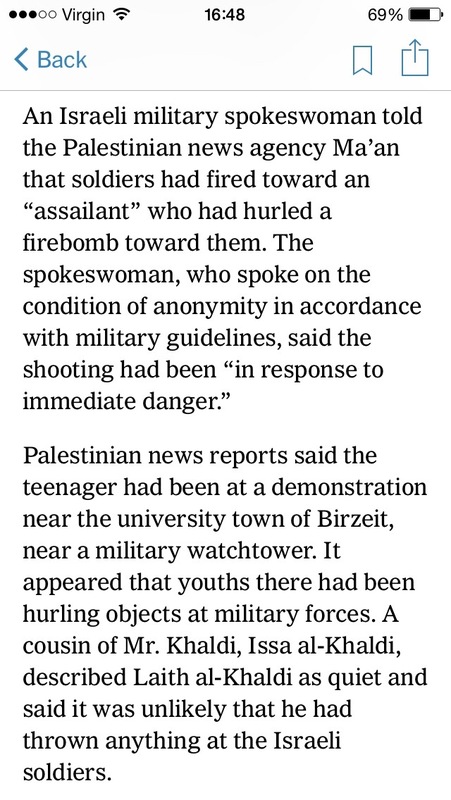 The day before, Israeli military forces shot and killed a 20-year-old Palestinian during a raid in Burqin, a farming town in the northern West Bank. 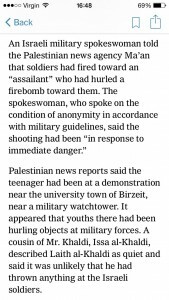 A military spokeswoman said Israeli forces had opened fire after Palestinians ignored an order to stop throwing rocks at them. 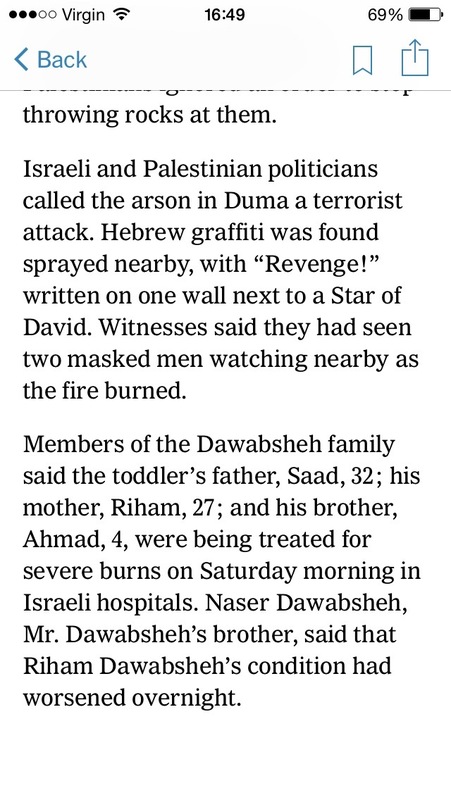 What’s lost is invaluable context, of the sort daily news reporting in general and the NYT in particular is often accused of failing to provide. 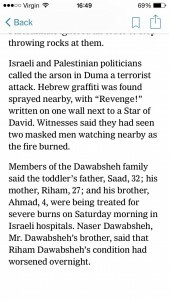 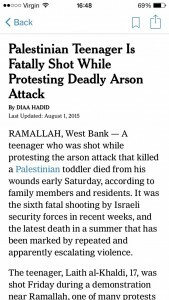 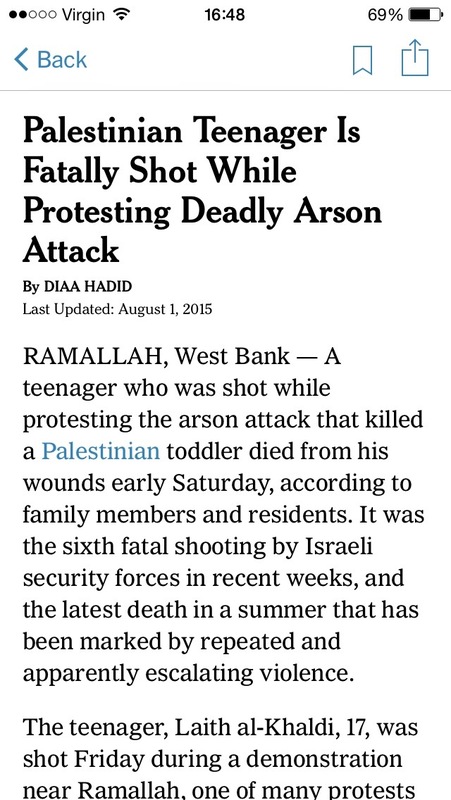 Those two grafs really echo the steady drumbeat of violence, of killings, which the Palestinians suffer on a regular basis (and which precede the murder of Ali Dawabsheh). 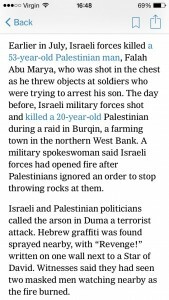 Laith al-Khaldi’s death looks less like an isolated incident at a particularly tense moment, and more like par for the disastrous course.